Should You Upgrade to the 2015 Honda Civic EX? One of the things we love about the 2015 Honda Civic EX is that it strikes the right balance between practicality and luxury, giving drivers access to some high-tech features you won’t find on the entry-level LX trim without hitting the price of the top EX-L trim level. A mid-range trim that has no trouble competing with the best of its rivals, we think the Civic EX offers something for everyone; let’s take a look at what it has for you. The 2015 Honda Civic LX is already pretty well-equipped from the start with Bluetooth HandsFreeLink, a rearview camera, Honda’s i-MID touchscreen infotainment system, Pandora radio compatibility, SMS texting, and more. To get an idea of just how remarkable the Civic is, compare the entry-level 2015 Civic LX and its competition. We put everything in a nice, convenient chart to make the comparisons easier. 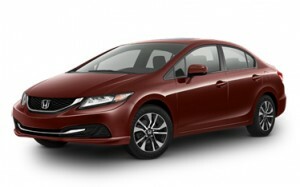 Whether you’re looking at the 2015 Honda Civic EX Coupe or Sedan, we want to put you behind the wheel to find out if it’s the right Civic for you. And if it’s not, don’t forget that the Civic Coupe has both the LX and EX-L trims while the Civic Sedan has LX, Special Edition, and EX-L trims to choose from. We also have the Civic Si in stock as well as the Civic HF and Civic Hybrid. In short, we think there’s a Civic for nearly any Central Illinois driver, and we want to help you find yours. Visit a Central Illinois Honda Dealer today to take a test drive. 0 comment(s) so far on Should You Upgrade to the 2015 Honda Civic EX?